Every year around this time I start to crave stew. I always thought the change in seasons signaled this urge, the cold tinge in the air sending my brain messages. 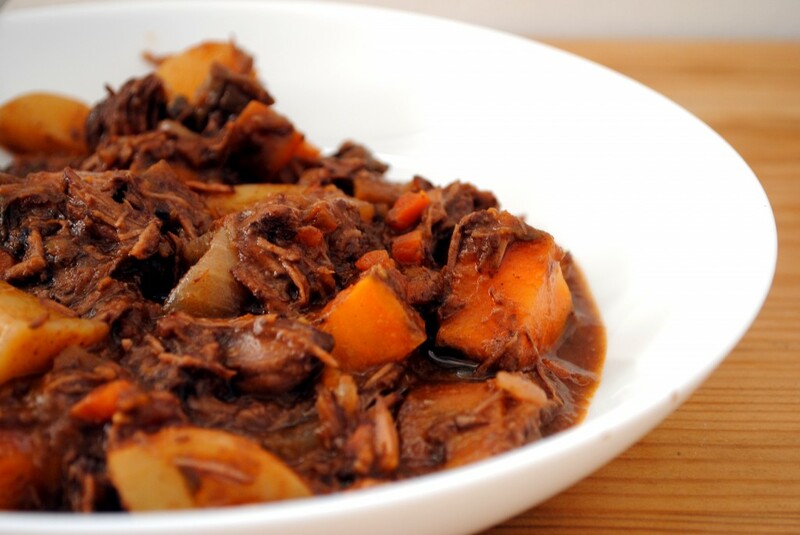 But right on time as soon as October hit I wanted nothing more than beef stew. Did I mention I live in the desert? I think part of the appeal in making a slow, lazy dish like this is that it indicates a certain level of leisure. The slow food movement is great – who wouldn’t want to take a step back and spend all day stirring a simmering pot? – but the truth of the matter is most of us don’t have that kind of time. I’m a personal fan of the crock pot for just this reason. But here I am, working from home, and able to let beef cook slowly until tender. I’m not going to include an exact recipe here because the truth of the matter is most of the time that’s not how I cook. I find a few recipes I like, see what ingredients I have, and wing it. So: the first step in any stew is to cut the meat into even chunks (I used about a kilo) and brown it quickly on all sides. Set aside. In the same pot or pan cook your your base until the vegetables are soft. 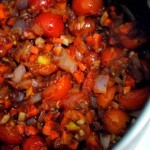 Here I used garlic, onions, carrots, halved cherry tomatoes, and thyme. I set aside some carrots to throw in at the end. 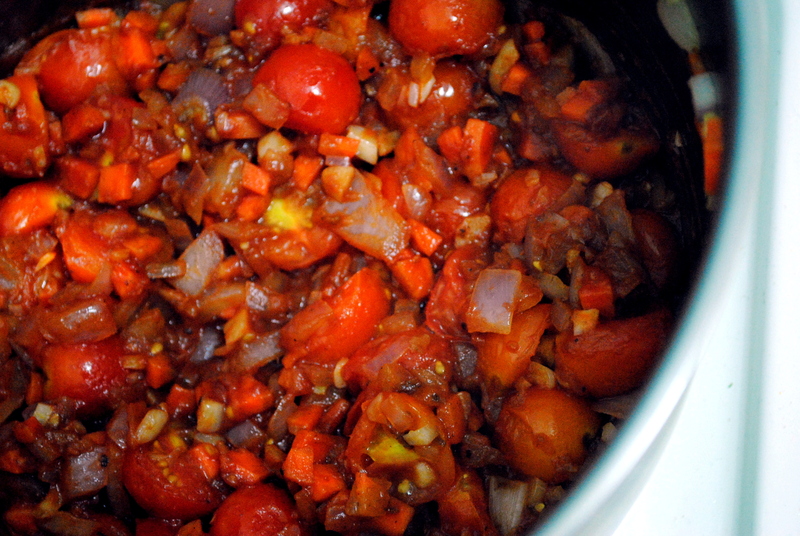 Once the vegetables are tender throw in some tomato paste, red wine (I used about ¾ bottle) and beef stock. Season with salt and pepper. Let that reduce slightly so the vegetables absorb the flavor. Add the beef back in, cover, and let simmer for four hours or so. About 3 hours in I add potatoes; here I included a mixture of russet and sweet potatoes.When the beef is tender I like to sauté mushrooms and the remaining carrots and add them to the stew. 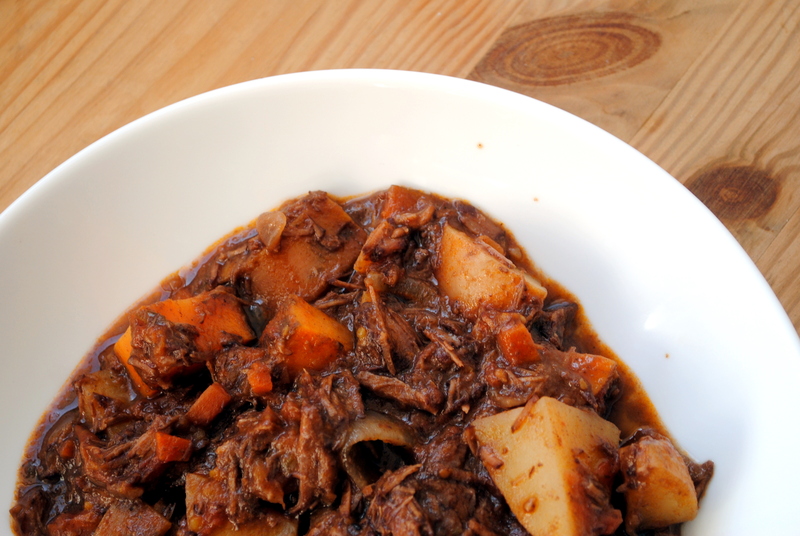 The next step is, I think, the single most important part to a successful stew: strain the stew into a large bowl. Pour all the liquid back into the pot and simmer. Skim the fat off the top. 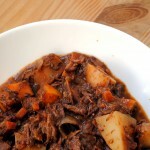 Allow the liquid to reduce until it’s the consistency you’d like your stew to be. I prefer mine thicker, with heft, so I let it take its time. This is also the point when you need to taste, taste, taste and see what needs fixing. I added more salt, some garlic powder, and finally cinnamon, which made the whole dish by adding a layer of complexity. Finally, add the stew back into the reduced liquid. Some recipes would call for you to remove all the vegetables and add fresh ones, but I kept everything as is. You can serve stew over egg noodles or rice, but we ate it straight out of the bowl.